TIP: Not everyone on a gf diet can tolerate oats. The oat flour can be replaced by 3 tbsp of rice flour. Tip: We rarely have buttermilk on hand and use 1 1/2 cups skim milk mixed with 1 teaspoon of vinegar. Let it stand for 5 minutes and you will have a reasonable facsimile of buttermilk! Heat your waffle iron as per instructions for iron. 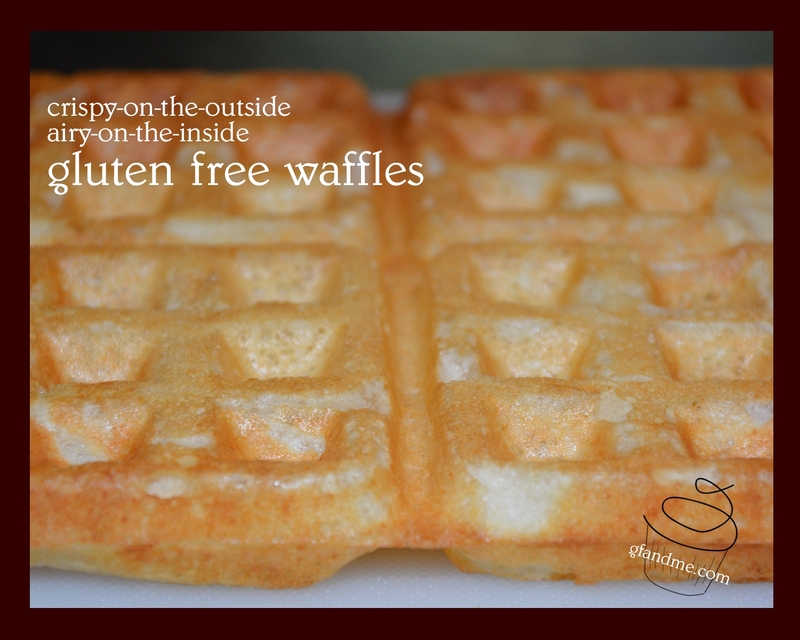 TIP: We lightly coat ours with oil to make sure the waffles don’t stick. In a large bowl, whisk together the dry ingredients until well blended. In a small bowl, mix together the oil, 2 whole eggs, and buttermilk. Make a well in the dry ingredients and pour in the wet. Stir until blended but can have a few lumps. Do not over stir. Will make a very wet batter. In small bowl (we use a 2 cup measuring cup) beat the egg whites with an electric mixer until soft peaks form. Then gently fold the whites into the batter. Do not over stir. Pour batter by onto iron and close. Cook as per instructions for your waffle maker. TIP: We use a Cuisinart Griddler with waffle attachments at 350 degrees for 5 minutes, adding 1 cup of batter per 4-section waffle. Cook a bit longer if you want a crispier outside. This entry was posted in Breakfast & Brunch, Recipes and tagged almond flour, Cuisinart Griddler, gluten free. Bookmark the permalink. Looks great, love the mixture of various flours – do you think the recipe would work with an egg replacement such as flax egg? I haven’t used egg replacer very often so I don’t know for sure. The recipe really counts on the beaten egg whites for its light texture. If the egg replacer can be beaten to stiff peaks, it might work. Otherwise, I would leave out the egg whites. The waffles will taste similar but won’t be as fluffy.